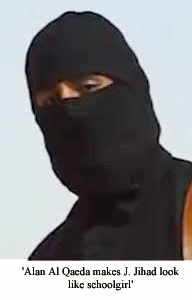 MI5 bosses experiencing a sharp slump in alarm rates over Johnny Jihad have revealed the latest terror threat to the UK and the wider world: Alan Al Qaeda. MI5 raised concerns as to the imagined threat that Mr Jihad posed to the country after Radio 4 broke the record for mentioning the term ‘Jihad’ in one day (Tuesday 3rd March), previously held by CNN in the build up to the U.S. invasion of Iraq in 2003, and UK terror rates did not even reach severe. Co-ordinating their own programming with that of MI5, Radio 4 plan to mention the word Al Qaeda over 20,000 times next Monday, featuring fundamentalist Islamic terrorism in all news items, Woman’s Hour, which will be read in Burkas, and the Shipping Forecast which will be broadcast live from the Straights of Hormuz. Brain of Britain which will be changed to Brain of Bahrain with the contestants made up of radicalised fundamentalist extremists and Just A Minute will feature two bomb disposal teams diffusing a suspicious package left by the contestants of Brain of Bahrain. This entry was posted on 5 March, 2015 in homepage and tagged Ethan Harrison, satire, spoof news. Bookmark the permalink.